Anyway, night one of meal planning had me in the mood for clam chowder. It was quite tasty - two thumbs up from hubs. Me too. This isn't the same as a true maritime chowder, but I'd like to think it strikes a balance between Chunky Soup and the Real Deal. 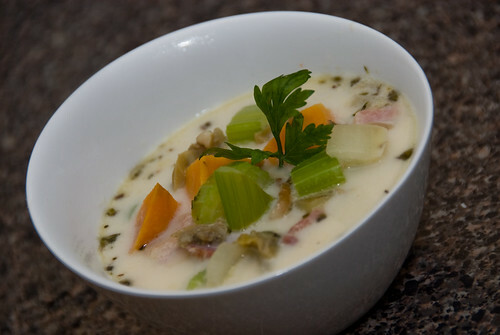 If you like chowder, don't have a lot of time and aren't scared of taking a few shortcuts, this dish is for you. 1. Run the hot tap water and fill a medium pot and set it on the stove to boil. 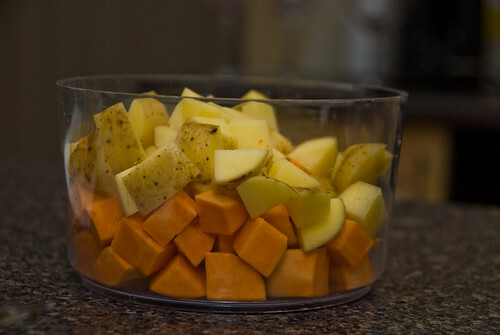 Now, cut your potatoes into small pieces and put in the water. Once it boils, let the potatoes cook until tender (about 10 minutes). You'll note that I underestimated the number of real potatoes I had in my pantry...so I used a spare sweet potato that was hanging around. I peeled it, but didn't peel the regular potatoes. It was a little weird in the chowder, but still good. 2. Over a large skillet, use kitchen scissors to cut the bacon right into the skillet. Turn the temperature to medium high. Use a wooden spoon to break it all up. 3. Now, cut both ends off the onion. Cut it in half length-wise. Chop. Wash your celery ribs, and cut them the long way. Now, line all four celery pieces up and chop (the initial instructions said to use a food processor, but for this small amount, it doesn't make a lot of sense to dirty a big appliance like that...it takes me about 10 seconds to chop an onion!). 4. 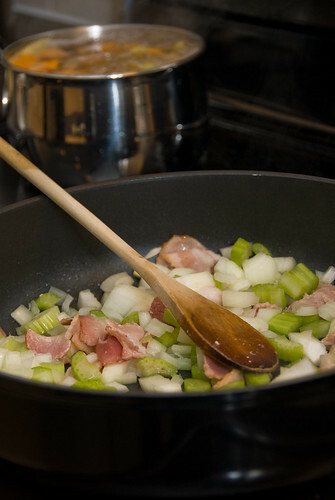 Add the onion and celery to the bacon. Keep an eye on your potatoes. 5. Open up the cans of clams and bottles of clam juice. Once the onion/celery mixture has softened, add the clams and juice to the skillet. Check your potatoes again (they are probably done now). Add the thyme and bay leaves to the skillet. Bring to a boil. 6. When the potatoes are done, drain them. Now, take your cream (I debated using light cream, but calculated the caloric difference would be minute) in a glass measuring cup and microwave it for 2 minutes to preheat it. Add the potatoes to the skillet. Reduce the heat. 7. Add the cream to the chowder and let heat through (try not to let it boil). Fish out the bay leaves and voila! It's done. All told, I thought this was pretty good. Next time, I might be tempted to thicken it a little bit with some cornstarch (i.e., mix some water and 1-2 T cornstarch together and add before adding the potatoes/cream), just because I like a bit of a thicker chowder. Flavours are awesome though. It's not the cheapest dish to make (about $3/serving), but it makes a lot (as you can see by all my leftovers) and it's yummy! Looks tasty and I'll be sure to make this for my Dad! I'm with you, I like a nice thick "chowda". I, too, like a thick chowder, but I definitely wouldn't pass a bowl of this up!! I've been following your blog for a while, and you always inspire me to make an effort with the dinners I cook. And congrats on your baby! Oooh I love clam chowder! This would make a great lunch! Yum!! You don't know how excited I am that you are back! finally, we have another reliable source for new recipes (I think the husband is getting a bit tired of the old staples...). 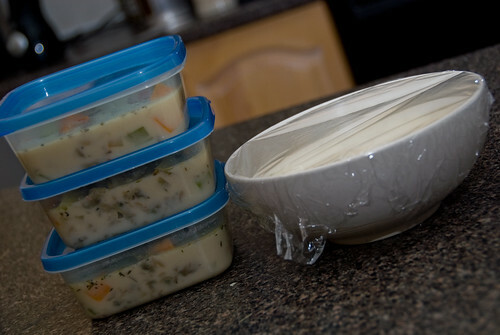 No baby here, but I have gone back to school, so I need things that are quick, easy, tasty. YAY! Congrats on Lil'Z! How exciting.